Are you a morning, afternoon or night person? Whether you have a hard time dragging yourself out of bed or hit an afternoon slump, twisting the body is a great way to find a natural energy boost! The following six poses will work to compress and decompress the internal organs, while also getting the blood flowing. No props are required for these poses, which means you can do them anywhere you can find enough space, so don't be afraid to bust them out at the office on your lunch break. These come from a 30 minute practice I uploaded to my YouTube channel this week - Twist & Energize Yoga Detox. Feel free to check that out as well. 1. Supine Twist - Start by laying down flat on the mat. Hug the right knee into the chest, while reaching long through the left leg. Cross the right thigh over the left side of the body. Reach the right arm out to the side, so that your right shoulder stays pinned to the floor. Use your left hand to gently guide the thigh down. Chest will face up, as the twist is from the naval and downwards. 2. Lizard Pose - From table top, step the right foot forward to the outer edge of the right hand (or wider towards the edge of the mat). Lift the toes up off of the ground and roll to the outer edge of the right foot, Press onto the right thigh with the right hand and move it away from the mid body. Opening the knee to the side and externally rotating the thigh. Twist the torso towards the right thigh. Return to table top and switch to the left leg. 3. Downward Dog Twist - From table top, curl the toes under and come into downward facing dog. Take a moment to bend the knees and pedal out the feet. From here step the feet in a bit to narrow your downward dog. Then take a deep bend in the knees. Reach the left hand towards the outer edge of the right shin. Bend in to your left elbow as you look under the right arm. Repeat to the other side. 4. 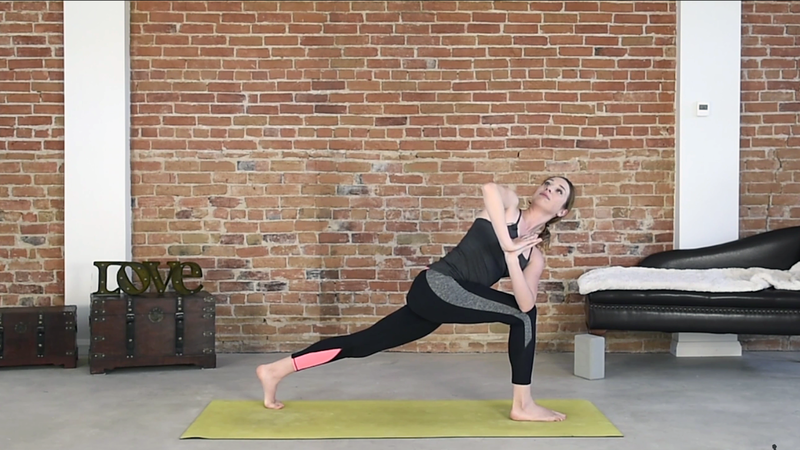 High Lunge Twist Series - Step to the front of the mat, bringing the feet to touch. Lower down into chair pose, bringing the hands together at heart center. Find lift on an inhale, as you exhale twist the left elbow over top of the right thigh. Press the palms into one another, and make sure your left knee isn't out passed the right. Look down and shift the weight more into the right leg as you step the left leg back, coming into high lunge while maintaining the twist. After holding here for a desired length, you may also bring the left hand to the ground and reach the right hand towards the sky. Look upwards only if that is alright for your neck. 5. Standing Pigeon Twist - Stand on the right leg at the front of the mat, cross the left ankle over top of the right thigh. Bend into the knees as you send the hips back and chest forward. This is already a lot of work, so feel free to hang out here. If you want to take it in to a twist as well, press the palms together and cross the left elbow over to the middle of the left foot. Don't forget to do the same with the right leg. 6. Seated Twist - Sit with your legs out in front of you. Pull the right knee in towards you and cross the right foot over the left leg. Bend your left knee so the foot comes next to the hip. Ground down for a stable foundation, reach the right fingers behind you. With your inhale, reach the left arm up, as you exhale hook the left elbow over the right knee. Pull the right shoulder down and back, opening up the chest. Want to add a bit more flow to these poses? Practice alongside the video below. Don't forget to subscribe to my channel, Yoga With Kassandra, I put out new videos each Thursday.